It’s stressful and time consuming when your to-do list is a guessing game, especially when you have to sort through emails and other tools to figure out what’s happening. Working in Asana helps you stay productive and organized to move work forward—all in one place. Follow along to learn how to plan your workday in Asana. My Tasks is your personal to-do list. It helps you prioritize and visualize your day’s work by automatically showing all tasks assigned to you and when they’re due. Come back to My TasksMy Tasks All tasks assigned to an individual can be found in their My Tasks list. Read more throughout the day to check off tasks you’ve completed, see any new work that’s come in, and get started on your next task. Check My Tasks when you start your day so you can see what you need to do now, and what’s next. Create new tasks for any other to-dos so nothing falls through the cracks. Use Calendar View to visualize your schedule. If your tasks have start and due dates, you can see the timespan you’ll be working on them to plan accordingly. Make emails actionable with the Asana for Gmail Add-on or Asana for Outlook app to quickly turn emails into tasks, instead of trying to manage your work and to-dos all via email. Forward emails tox@mail.asana.com to turn them into actionable work in My Tasks. Instead of CCing teammates, add them as task followersfollowers Add followers to any task and they will receive notifications about updates to the task. Read more so everyone can keep working in Asana and avoid the long email chains. Use integrations to connect Asana with tools you’re already using to save time and reduce context switching. Check out GSuite, Adobe Creative Cloud and Litmus. Attach any relevant files to tasks you’re working on—instead of keeping them in a separate folder—so you and other teammates can easily find them and collaborate on them in context with instructions and feedback. Want to master using and organizing My Tasks? Check out our Asana Lessons and get up and running in just a few minutes. Prioritize tasks with Today, Upcoming, and Later to get a clear picture of your day, week, and month so you can stay on top of deadlines and work on what matters most. Click the blue dot next to a task, drag and drop tasks into Today, Upcoming, and LaterToday, Upcoming, and Later Today, Upcoming, and Later are sections that divide the My Tasks list. 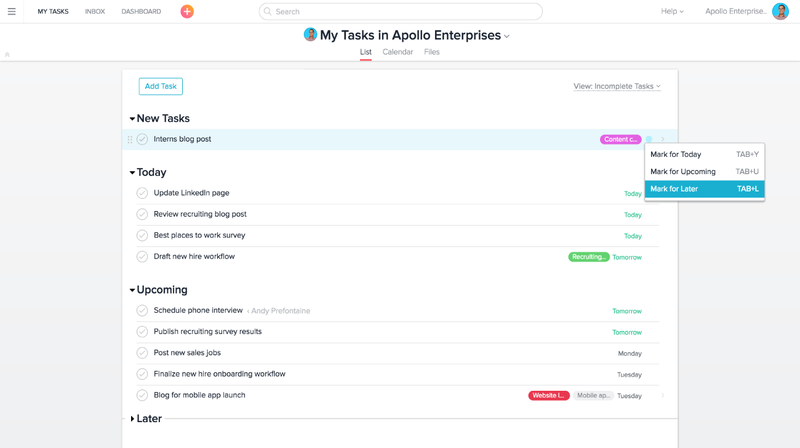 Users can drag tasks into these sections to prioritize them. Read more , or use shortcut keys to keep them prioritized and organized by date and priority. Download the Asana keyboard shortcuts cheat sheet. Download a copy Save this pdf or document to your desktop. Share by Email Send a link to this article to your team. Share in Asana Create a task in Asana to share this article with your team. Use different views to see your work by due date, complete/incomplete tasks, or on a calendar so you don’t get caught by surprise or forget about an upcoming project. You can even view My Tasks in our mobile app for quick access after hours or on your commute. Mark task dependencies so you know when you can get started without having to keep asking a teammate about the status of their task. You’ll get notified when they complete the task you’re waiting on. With Asana, you’ll get updates on only the work you’re following in Inbox. 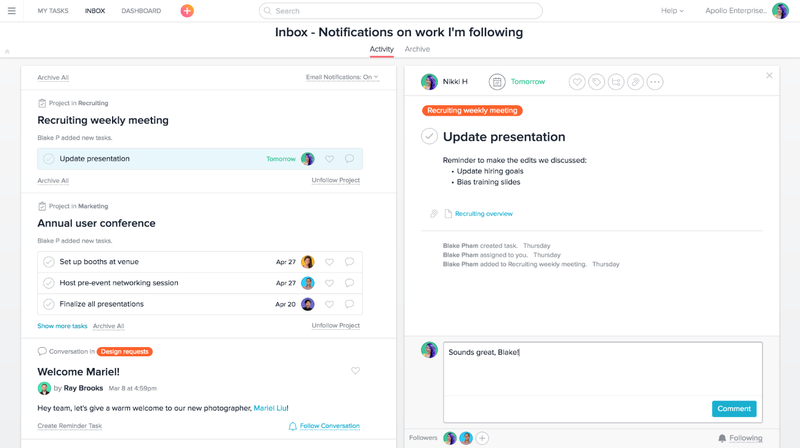 But unlike your email inbox, you don’t need to worry about organizing your notifications—everything is already in Asana. Check InboxInbox My Inbox displays activity on tasks, projects, or conversations a user follows. Read more throughout the day to keep a pulse on work, but stay focused on the task at hand. As you and your teammates comment on, attach files to, and complete tasks you’ll get notifications. You don’t have to message them separately to let them know or ask if something is done. Use task comments to communicate about updates specific to that piece of work. And as the project moves forward overall, you can communicate to all stakeholders with project status updates. 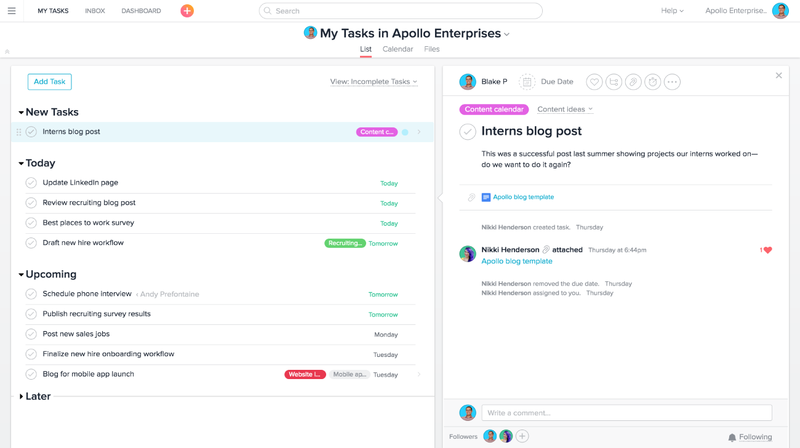 Your work in Asana is connected and visible, so teams don’t have to work in silos or try and get everyone in the room at once. Follow only the work you need to be a part of. Most calendar invites don’t give you much context about the meeting agenda, which leads to poor preparation, or sitting through meetings you didn’t really need to attend. 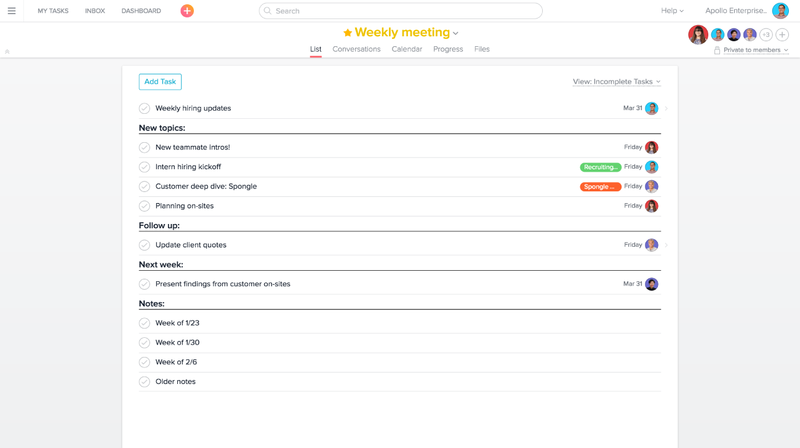 Use Asana to run your meetings to stay on topic and on time. Create a project for your meeting and use tasks to list your agenda items. Create additional sections for any notes or follow-up tasks. Then after the meeting, make sure any action items are assigned so it’s clear who’s responsible for them and they aren’t forgotten after the meeting. Help presenters and attendees prepare by attaching any files to tasks in the meeting project to make sure everyone comes with the right materials. If someone needs to present about work that’s already occurring, you can add existing tasks to the meeting project so you don’t need to duplicate information. There are tons of ways to use Asana to make your work day work for you, but here are a few general tips to help you stay organized and productive with Asana. Keep a browser tab with Asana open, and check it throughout the day for any new tasks and updates on work you’re following. As you finish work, make sure to check off tasks, add comments, attach files, update custom fields, and more in Asana so your teammates know what’s going on. If you own or work in a lot of projects, favoritestar Users can star projects, people, tags, or custom search views to easily access them in the sidebar. Read more them by clicking the star next to their name. Then they’ll always be easily accessible in your sidebar and from the Asana mobile app. Take the last 10 minutes of your day to head back to My Tasks and check off anything you completed, and make sure your workload for the next day is realistic. You can use the Calendar View. Use our Android or iOS apps when you’re away from your desk, in between meetings to jot down ideas, or on your way home from work to gauge priorities for the next day. Check out our How to Asana video and follow along. Subscribe to Asana’s channel to get new tips every week. Get in the zone and stay there by planning your day in Asana. Now that you’ve created your first project, you can add more workflows by following our use cases or templates and track them in a portfolio.